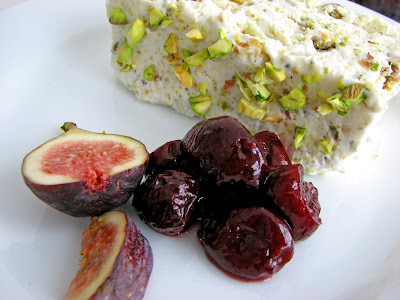 If you ever find yourself wishing for a creamy cool dessert but don’t want to haul out the ice cream maker or fuss with making a crème anglaise, this semifreddo is your dream dessert. It’s like a very light cold mousse and comes together so quickly you almost wonder how it could taste so incredibly good. Semifreddo is the Italian term for "half cold" and is often used as the description for many kinds of partially frozen desserts. 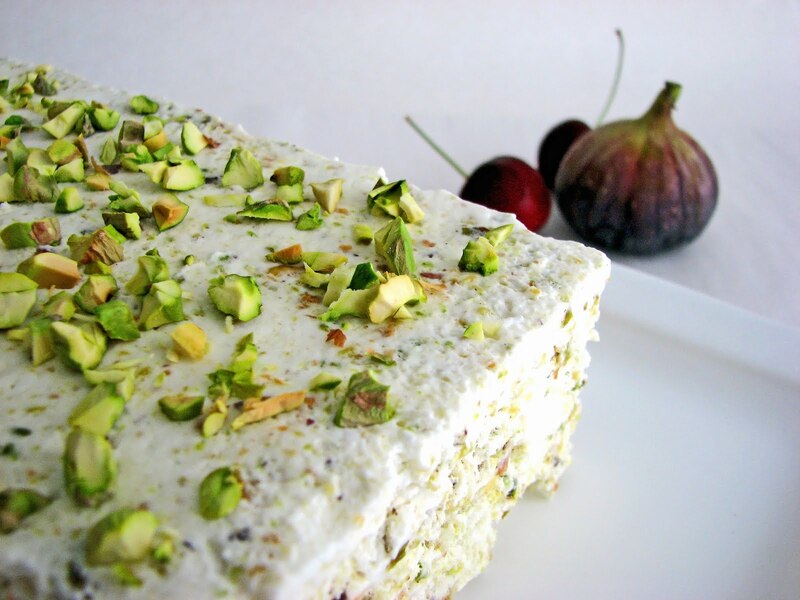 Some versions require an Italian meringue made with hot syrup and/or an egg yolk-sugar base, but this Pistachio Semifreddo just consists of pistachios, meringue and whipped cream folded together with a splash of almond extract to add just the right level of robust nutty flavor. It's impossibly simple and supremely delicious. Although certainly worthy of a special occasion, don’t bother to wait too long to enjoy this wondrous dessert. - This is a half recipe. You can double and pour into a 2 quart bowl and use a scoop to serve. 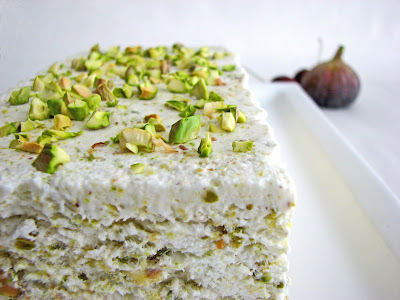 - The recipe calls for salted pistachios. If you can’t find them, be sure to add a tiny pinch of salt to the recipe. - When lining the loaf pan, place a strip of parchment on top of the plastic to create a smooth surface. If you don’t have parchment, once you've unmolded it, you can use a warm knife or metal spatula to smooth the creases. - I’ve chosen to serve it with some cherry compote and figs but it would be equally delicious with an element of bittersweet chocolate, whether it be a simple chocolate wafer, a light drizzle of chocolate sauce or a thin layer of cookie crumbs or cake on the bottom or top of the mold. - Whip the cream just until soft peaks form. This means the cream should have a soft lilt that is very droopy and does not hold its shape. If you go too far, the mixture will be grainy. The meringue should be beaten to a stiff peak, which means it should stand up when peaked without falling over. Grind 1/2 cup pistachios with 1/4 cup plus 1 tablespoon sugar in a food processor until very finely ground. Pour into a bowl. Coarsely chop the remaining 1/4 cup pistachios and combine with the finely ground mix. Beat egg whites until they are opaque and hold soft peaks. Add remaining 3 tablespoons sugar just a little bit at a time, increasing speed to high. Beat until meringue holds stiff, glossy peaks. Whip chilled cream with almond extract until it just holds soft peaks. Gently fold meringue into whipped cream. Fold in nut mixture. Using a rubber spatula, pour into an 8 1/2” x 4 1/2” loaf pan. Smooth the top until it’s level. Place in your freezer until firm, about 8 hours. Run a thin knife or small metal spatula around the edges of the pan to loosen. Place a serving plate on top of the pan and invert. Carefully pull off the plastic wrap and parchment if you used it. Garnish with chopped pistachio. I love the pleasure of working with yeast doughs. There is so much satisfaction in mixing and kneading and the smell of yeast always brings an incredible sense of anticipation. Watching the yeast work its magic and then experiencing the aromas that emanate during the baking process fully explain why we love pastry making. 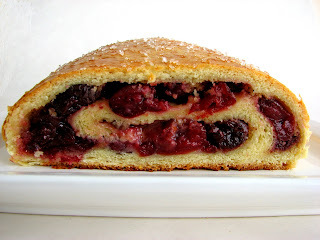 Here is a yeast dough tucked with fresh cherries of the season and an almond frangipane. Although it’s a simple recipe, it does have a few stages. You can certainly make the cherry filling and frangipane a day or two ahead and keep them refrigerated. Once you have your dough proofed, it all comes together quickly and easily. Bake for about half an hour and you have a delicious sweet bread fit for a lovely brunch or as an afternoon treat with tea or coffee. 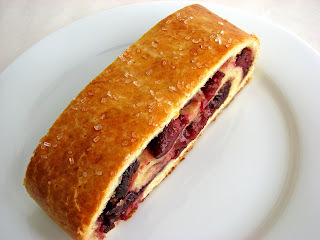 - I always roll my dough out and finish the pastry on top of a piece of parchment paper. This eliminates having to lift the pastry itself onto a baking sheet and having it lose its shape. Instead, simply lift or slide the parchment onto the baking sheet. 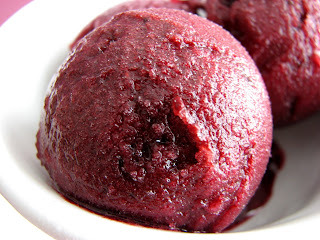 - I left the pitted cherries whole for a bit of texture, but puree them if you want a smoother filling. 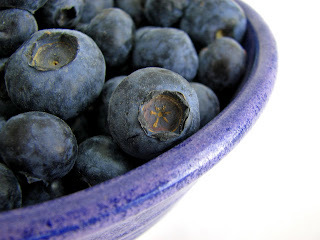 - Substitute your favorite fresh fruit in season. Or soak some dried fruits and spices in the winter. - Leave out the frangipane or replace it with pastry cream or lemon curd. 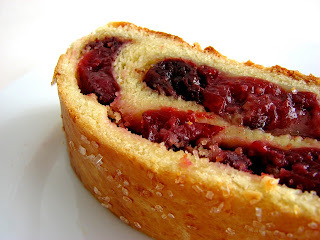 - Garnish with your favorite glaze or a crumb streusel for a sweeter version. I keep extra streusel in an airtight container in my freezer. 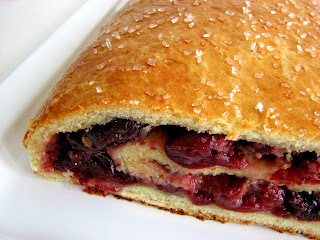 - You might also enjoy creating a Gâteau Basque this cherry season. Heat the 1/2 C of milk just until it's warm. Dissolve yeast in 1/4 C warm milk with 1 teaspoon of the sugar. Place the pieces of butter in the remaining 1/4 C of warm milk. When butter has melted, stir in the sugar, salt, vanilla and yeast mixture. Add the eggs and blend thoroughly. Slowly stir in about 2 1/2 C of flour. If necessary, add more flour by the tablespoon until you have a dough that is ready to handle. Knead until smooth and elastic. Place in a lightly oiled bowl, cover and let rise in a warm place until doubled, about 2 hours. Press down on the dough and turn out onto a clean work surface or piece of parchment lightly dusted with flour. Roll out the dough to an approximate 15” x 10 1/2” rectangle. Spread a thin layer of frangipane, leaving a 1“ border on all sides. Top this with a layer of cherry compote. Starting at the shorter end, pick up the dough gently and begin to form a flat roll. Keep folding over a couple of times. You should wind up with a pastry about 11” long and 4” wide. Place seam side down on a parchment lined baking sheet. Tuck the ends under and pinch gently to seal. Preheat the oven to 350 degrees. Brush the pastry with egg glaze and sprinkle with coarse sugar. Bake for about 35 – 40 minutes until lightly browned. Transfer to a rack and let cool. Bring the sugar and water to a boil to dissolve. Add the remaining ingredients. Bring to a boil for just a minute or two and then reduce heat. Simmer on low heat for about 30 minutes until the liquid is syrupy and has reduced and the cherries are tender, tasting and adjusting for sugar and/or lemon juice as necessary. Cool. Can be made and stored in your refrigerator for a couple of days. Remove the vanilla bean and drain the syrup from the cherries before using. Place the almonds and 1/4 C sugar in the bowl of a food processor. Grind until fine. Add the flour and pulse to combine. Cream the butter and remaining 1/4 C sugar until fluffy. Add the eggs one at a time, beating until incorporated after each addition. Add the extracts and nut mixture and process until smooth. Can be made and stored in your refrigerator up to 2 days. Let sit at room temperature until it is spreadable. My obsession with oatmeal continues. And it can only be matched by my current obsession with plums. Until figs arrive (I’m hearing perhaps next week! ), I have been buying lots of plums along with all the other wonderful stone fruit available now. And since shortcake seems to be the fun and fast dessert of the moment, it’s time to give this great combination a try. As with the Cornmeal Shortcake with Peaches I posted a couple of weeks ago, this comes together fairly quickly but you do have to be gentle when mixing the dough for the shortcake. The thing that makes them so delicious is very little handling so as not to develop the gluten in the flour. The result is a tender and delicious base for some lightly spiced plums and billows of whipped cream. 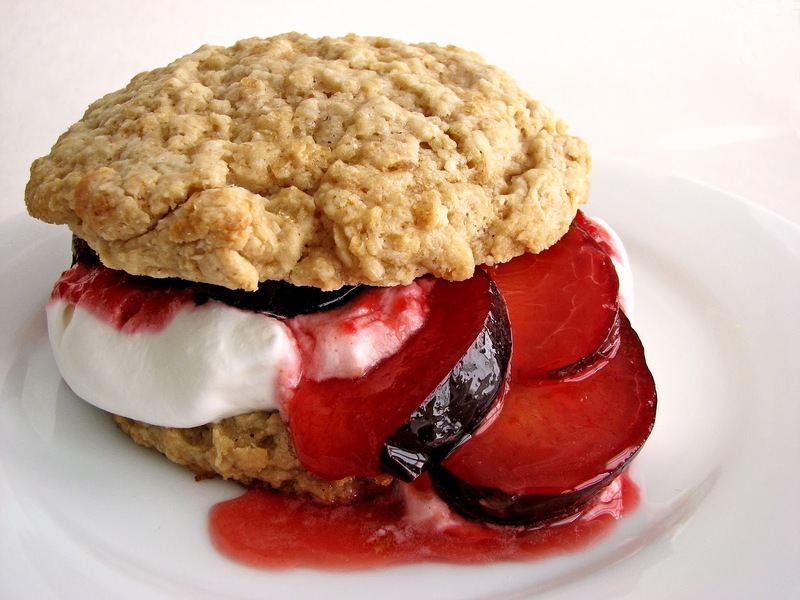 The brown sugar in the shortcakes adds a rich flavor that goes so well with the toasty oatmeal. I’ve added some cinnamon to both the shortcake and the fruit and cooked some of the plums to create a jammy sauce for the fresh fruit and cream. 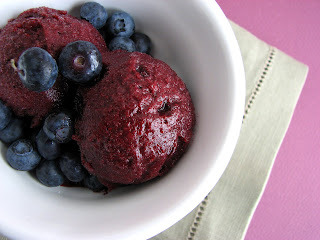 I love the beautiful colors and the simple yet irresistible way to enjoy all these natural ingredients. Set this plate on your table and see what happens. - The butter and buttermilk must be very cold. Work fast so they stay cold. - The dough is very sticky, but you won’t be handling it much more than a few seconds, only gently patting it into shape. Just be sure you dust your hands and the work surface very lightly with flour. Keep the flour and the mixing to a minimum to avoid toughening the end product. - You can add lemon or orange zest or finely chopped nuts to the shortcake dough for more variation. 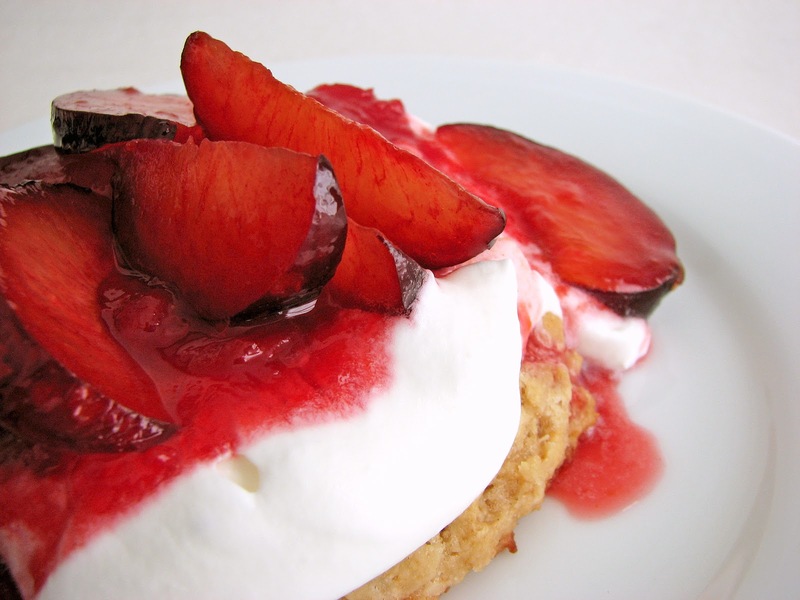 - This shortcake would also taste great with peaches, blackberries, figs, cherries or caramelized apples or bananas. Add a touch of light caramel syrup to the fruit or a syrup steeped with herbs. 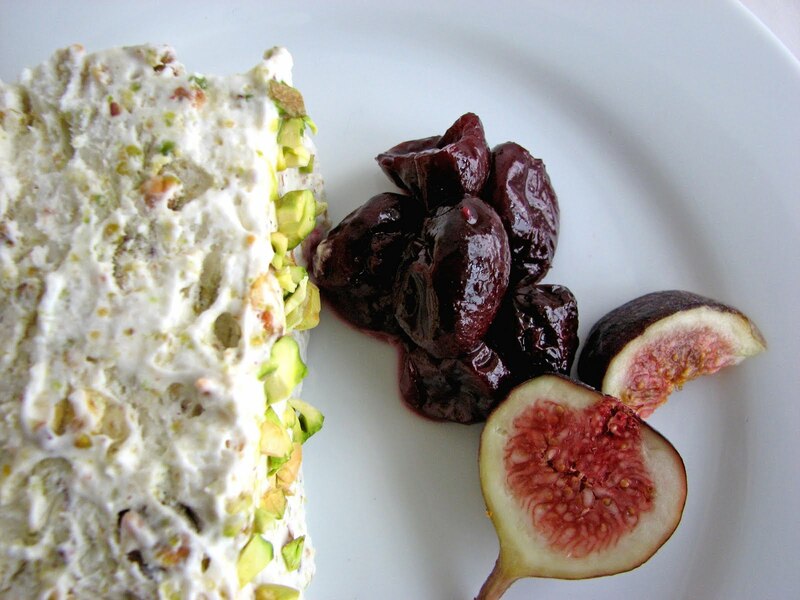 Top with yogurt for a lighter and tangier garnish. Cut plums in half and remove pits. 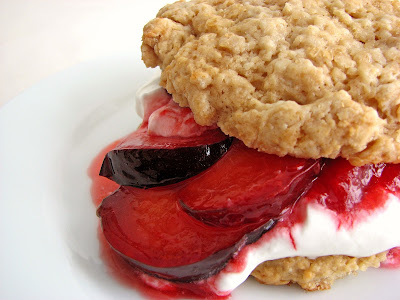 Slice 6 plums thinly and toss with a splash of lemon juice and 1 tablespoon of sugar. Set aside. Coarsely chop the remaining 3 plums and place in a saucepan with about 3 tablespoons of water. Add 2 tablespoons of sugar and the cinnamon and simmer over low heat until the plums begin to soften and release their juices. Taste for sugar and add more if needed. When the plums look saucy, remove from heat and add lemon juice to taste. Cool. You can either puree the sauce or leave it chunky. Whisk together the flour, oatmeal, baking powder, salt, sugar and cinnamon in a bowl. Add the pieces of butter and use a pastry blender until the mixture looks like coarse meal. Work quickly so the butter stays firm and cold. Add the buttermilk all at once and stir gently with a fork just until it begins to come together in clumps. Do not overmix. The dough will be sticky. Dust your hands lightly with flour and gather the dough clumps in your hand. Place any unincorporated flour on a clean work surface or a piece of parchment and set the dough on top of that. Gently pat the dough together with your hands. Shape it into an 8” round and either cut into 6 wedges or use a round cutter dipped in flour and cut out 6 biscuits. Place the shortcakes on the prepared baking sheet. Brush with some cream or milk and sprinkle the tops generously with coarse sugar. Bake about 10 - 12 minutes, until the shortcakes are lightly golden. Cool on a rack. Whip the cream, sugar and vanilla just until soft peaks form. Slice shortcakes in half. Transfer biscuit bottoms to plates. 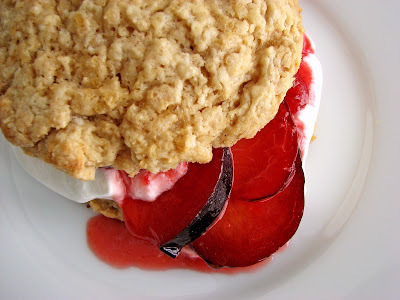 Spoon some whipped cream on each shortcake, then some of the plum compote. Top with some fresh sliced plums. Place biscuit tops over plum mixture. Serve immediately. Café Verlet on Rue Saint-Honoré is a traditional French café that has been doing business since the late 19th century. They serve what most argue is the best cup of coffee in Paris. 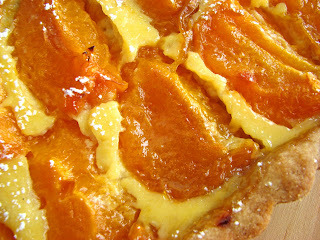 Among its other notable pleasures is this very rustic Apricot Tart. With a hint of almond to enhance the jammy apricots, this tart is so quintessentially French it’s hard not to dream about sitting at a table at Café Verlet while savoring each and every bite. The tart begins with a very easy crust that is pressed into the tart pan. The filling is crème fraîche sweetened with a touch of lavender honey. 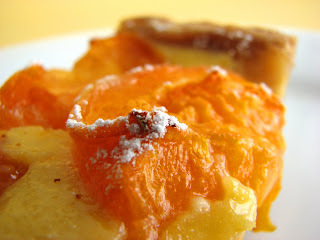 It bakes to a very thin layer of custard that complements the deliciously tart apricots and crisp cookie crust. Barely sweet and extraordinarily simple, this is all about showcasing delicious fresh fruit. If you love apricots and simple seasonal desserts, you will certainly enjoy this tart. - My oven runs hot and my pastry crust got a bit too browned. The tart was done in about 40 minutes, so watch yours closely as the crust will taste bitter if it browns too much. Next time I might lower the temperature to 325 degrees when the filling is added. - I used crème fraîche for the filling rather than heavy cream. For a quick crème fraîche substitute, use 1/4 C + 2 T sour cream, 2 T buttermilk and a few drops of lemon juice. I also used regular flour instead of "Wondra." 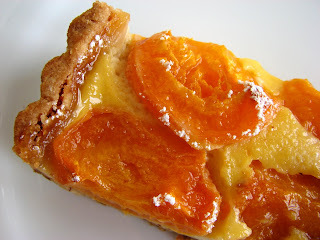 - I always favor desserts and pastries that are not too sweet, but I did add a generous sprinkling of sugar on top of the apricots because while the crust is the sweet element, apricots become quite tart when baked and the cream filling is not sweet at all. - I thought the recipe seemed to call for far too much almond extract, but it worked out fine. Be sure to use a quality brand. 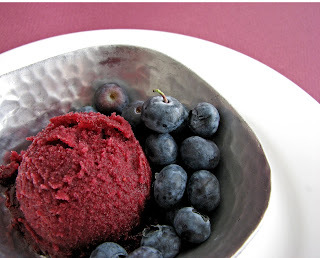 - This would be good with any sort of stone fruit or berries. Preheat the oven to 350°F. Butter the bottom and sides of a 9” tart pan with removable bottom. For the pastry, blend together the melted butter and sugar. Add the extracts, salt and flour to form a soft dough. Place the dough in the center of the prepared pan. Use the tips of your fingers to press the pastry along the bottom and up the sides of the pan in an even layer. Place the pan in the center of the oven and bake until the dough is slightly puffy and set, about 10-12 minutes. Remove from the oven and sprinkle the ground almonds over the bottom of the crust to prevent the crust from becoming soggy from the filling. Combine the crème fraîche or cream, egg, extracts and honey. Whisk in the flour. Pour the filling evenly over the pastry. 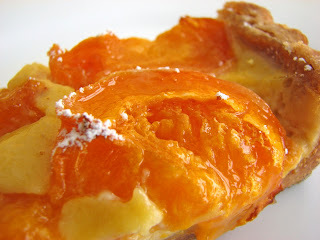 Place the apricot halves in an overlapping decorative pattern, cut side up. Bake the tart on a sheet pan until the filling is firm and the pastry is a golden brown, 55 to 60 minutes (mine baked in 40 minutes, so watch it closely to avoid the crust from browning too much). Place the tart on a rack to cool. Remove from tart pan and sprinkle with confectioner's sugar.